This set of themes of the relation of populations to their environment, the construction of oasian nature(s), was central in my work before even my doctorate. 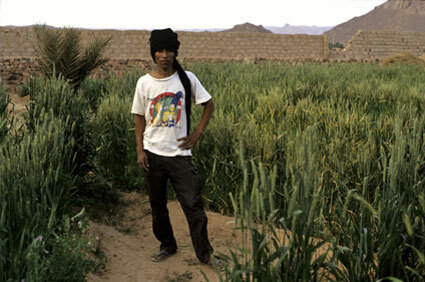 Djanet (Algérie) - avril 1993 - un Touareg nigérien venu travailler comme journalier dans les jardins de Djanet. Approche ethnobotanique d’une oasis saharienne: Djanet (Algérie), (directed by Pr. R. Pujol - Laboratoire Ethnobiologie-biogéographie, Muséum national d’Histoire naturelle). My doctorate took partially place while I held a position of researcher (1994-1996) for a French-Tunisian project of development (between the French development center Cirad and the National Institute for Agronomic Research of Tunisia (Inrat): the project for the Oasis agriculture development in the Jerid (Tozeur, Tunisia). This was the opportunity for the publication of a big report, diagnosis of the Jerid oasis agriculture: Oases of Jérid: permanent revolutions? My thesis of doctorate in social anthropology (1993-1998) related mainly to the oases of Jérid to Tunisia (South-West), but also of Djanet in Algeria (South-East) and Zagora of the valley of Draa in Morocco (South). This thesis has been published (in a very reshaped version) in French under the title: Gardens to the desert, Evolution of Oasian practices and knowledges, Jerid, Tunisia. 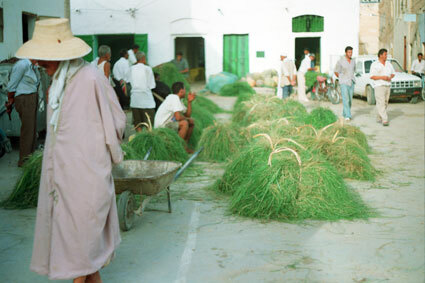 Tozeur (Tunisie) - 1995 - le côté du souk, où les jardiniers viennent vendre eux-mêmes quelques bottes de fourrage. This article has been read 2165 times. Dernière mise à jour de cette page le Friday 21 September 2007 à 16:08:22. //// -----> Citer cette page? Vincent Battesti, "Oasian natures in North Africa" [en ligne], in vbat.org anthropoasis, page publiée le 23 May 2005 [visitée le 13 April 2019], disponible sur: http://vbat.org/spip.php?article150.